Dr Julius Peter, then Chief Technical Officer at Continental AG patented his idea of Tandem Mixing Technology in 1989. His colleague, G. Weckerle, manager at Continental Technical Rubber promoted this technology at his factory in Northeim, Germany on K2A, K4, K5 and K7 type of mixers. Francis Shaw & Co had sole world rights for supply of the intermeshing type tandem mixers. Today, HF Mixing Group (Harburg-Freudenberger Maschinenbau GmbH) are owners of tandem mixing technology by virtue of their acquisitions in the rubber machinery world. Here are 9 key things about tandem technology in rubber mixing you should know to impress your boss. 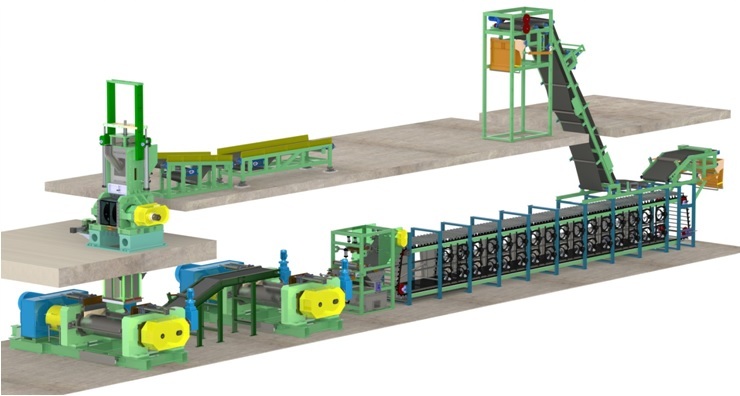 Tandem technology separates the two main tasks in your rubber mixing process viz. dispersion and distribution. Dispersion means breaking down of your solid materials such as the fillers. Distribution involves achieving homogeneity within your rubber mix compound with its different chemicals added. The temperature profile which is absolutely essential for inducing chemical reactions during your rubber mixing process can be better controlled when these two stages are separated. In Tandem technology you interconnect two “mixers” in series, a ram type mixer on top of aramless mixer. Each machinery is optimised to perform one rubber mixing task. Ram type mixer does dispersion well whileramless tandem mixer does the task of distribution. Your masterbatch produced in the primary ram mixer is transferred without intermediate storage to the ramless tandem mixer below. Here your batch is cooled and finals mixed. At the same time a new masterbatch is prepared in ram mixer above. The upper mixer with ram is preferably (but not necessarily) intermeshing type. As your masterbatch mixing does not involve the addition of curatives or accelerators and is essentially a heating operation, the mixing cycle may be carried out rapidly without any need to cool your mixer before the next mixing cycle. Between the two mixers is a discharge flap and chute which would be closed at all times except when the lower tandem mixer receives the masterbatch dump from above. The mixer below must be intermeshing type to enable self-feed without pressure and work without a top ram. The finals rubber mixing function is usually a shorter process than the masterbatch stage. This means that the tandem mixer has an idle time after the discharge and before receiving the next hot masterbatch. This idle period with the discharge door open allows the tandem mixer to cool. The final mix compound is then dumped into a two-roll mill or a dump extruder and processed in the normal way. When the two tasks of dispersion and distribution are separated, your compound weight is relatively smaller in the larger lower machine. Hence, you can operate this ramless mixer at a higher speed. This improves the quality of your mix because your compound is moved around the mixing chamber more number of times. Excellent cooling water circulation to the mixers is a must in tandem mixing technology. The population of tandem mixers is higher in the tire industry while its economy of operations is tempting the non-tire rubber industry as well. Do you plan to reduce the mixing stages for your rubber compound (Read on Single-Stage or Two-Stage Mixing here) using tandem technology? Let us know. Categories: Compounding Machinery, Mixing Machinery, Non-Tire Rubber Industry, Tire Industry | Tags: carbon black, Compounding, Continental AG, dispersion, distribution, Dr Harald Keuter, Dr Julius Peter, finals mix, Francis Shaw, G. Weckerle, Harburg-Freudenberger Maschinenbau GmbH, HF Mixing Group, Intermeshing Type Mixer, K2A Mixer, K4 Mixer, K5 Mixer, K7 Mixer, masterbatch, non-tire rubber industry, Rubber Machinery, rubber mixing, silica, tandem mixer, Tandem Mixing Technology, tire industry, Two-Roll Mill | Permalink. Think rubber mixing room, and the image that conjures up in your mind is that of a “black room“! Factories that have open two roll mill mixing have carbon black particles all over the place, lending credibility and authenticity to “black mixing rooms”. Dust collection system reduces this to a large extent. When an internal Banbury mixer or Intermix mixers with semi/automatic carbon feeding, filler feeding, oil dosing and effective dust collection systems are deployed, they present a safer and cleaner environment. Maintenance is easier and mixing rooms need not be “black” any longer. A representative image of a mixing room is as below. Depending on the technology and layout adopted, the set-up could vary. And if you are curious to visualize how the complete system works, here is a video of a rubber mixing line. Newer and most state-of-the-art rubber mixing and compounding factories invest in automated rubber mixing rooms to reduce reliance on labour, increase efficiency and production. Categories: Compounding Machinery, Mixing Machinery, Non-Tire Rubber Industry, Tire Industry | Tags: banbury mixer, carbon feeding, dust collection, efficiency, filler feeding, intermix mixers, oil dosing, rubber mixing, Rubber Mixing Room, Two-Roll Mill | Permalink.